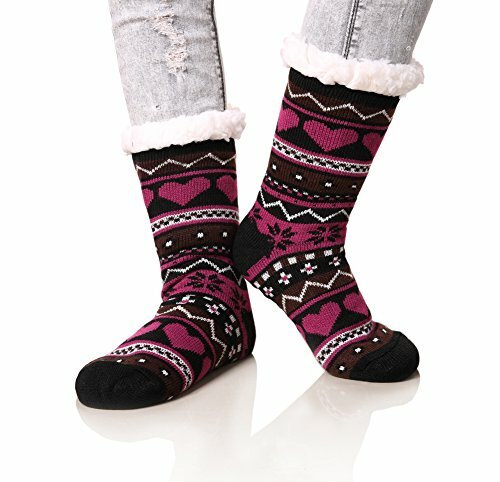 ❤ HIGH QUALITY SLIPER SOCKS — Dosoni women winter socks are made of 95% Polyester, 5% Spandex. Super thick fleece interior for maximum warmth and comfort .Non-skid bottoms to prevent slipping and sliding . ❤ THICK THERMAL FUZZY SOCKS — Best Christmas Gift Fleece-Lined Cozy Crew Socks. Soft cloud-like fluffy material will keep your feet and toes warm on cold weather! Fleece Lining is super soft and cozy. You will treat it as thermal socks. ❤ ONE SIZE — Free size 23 to 25cm, suitable for Women US size 5 to 10. They are elastic and perfectly make it suitable for your feet.